Video games are great for relieving tension and stress; sometimes playing is like an escape from reality. However, for some people, it's hard to return to reality after a long gaming session. One young man in China took his love for League of Legends a little too far. It's unknown when this story was first broadcasted but it appeared on Chinese microblogging site Sina Weibo yesterday. The image, a screenshot of China Central Television's news show (CCTV). The telecast showed a LOL player in cosplay and then something hiding in a bush. The story broadcasted provided the context. Basically a 16 year-old boy was playing LOL. After a two-day binge, the young lad left the internet cafe early in the morning. It's unknown why but he suddenly decided to run onto a grass field, found a stick and started wailing on passersby's. 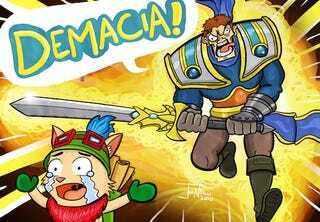 He did it all while screaming, "for Demacia". According to other Chinese media, one bystander said, "thank god he wasn't level 6 other wise this would've turned out ugly." The case of this 16 year-old wasn't the only story involving game worlds jumping into the real world. In Fuzhou, Fujian province two 16 year-old was arrested for carrying a bladed weapons in a bar. It was reported that the young men were playing a Chinese online game called "Soul Medicine". Seeing characters in the game carry bayonets, the young men, surnamed Yang and Xu, thought it was cool so they decided to carry a knife like the characters did in game. They were spotted by a bar patron and reported the police. It's lucky that no one got seriously hurt from these delusional teenagers, well save a few bumps on the head by the kid screaming, "for Demacia". Let's hope these kids get some help learning the difference between video games and reality.